BenQ projectors deliver ultimate colour accuracy for 4K cinema performance | What Hi-Fi? You can't beat an awesome big-screen picture, especially when it comes to immersing yourself in a film. But it's no use having an eye-grabbing image if it's not faithfully delivering the movie as the director intended. Accurate colours are crucial to enjoying the action and can make a big difference to the atmosphere of a film; whether it's ensuring faithful skin tones, delivering detailed dark levels or using a specific shade to set the tone of a scene. BenQ creates projectors that achieve accurate colour reproduction. BenQ calls this technology CinematicColor and it's featured on the company's latest 4K UHD home cinema projector, the W2700. 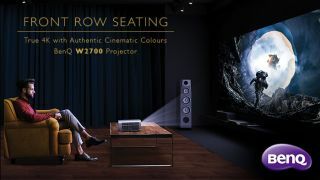 The W2700 is the world’s first 4K home theatre DLP projector featuring DCI-P3 colour for lifelike colours – another first from the world's number one DLP projector manufacturer. Working with Hollywood professionals, such as award-winning cinematographer Jake Pollock, BenQ aims to deliver the truest, most authentic image, to ensure you really are bringing the magic of the movies into your home cinema. This accuracy is especially important when watching 4K HDR video. The BenQ W2700 delivers true 4K performance with 8.3 million pixels, and its performance is rubber-stamped by adhering to the cinema industry's DCI-P3 colour standard. This ensures the projector is capable of a level of performance that's certified by Hollywood professionals and rivals high-class digital cinemas. CinematicColor means the W2700 projector delivers 95 per cent coverage of the super wide DCI-P3 colour and 100 per cent of Rec. 709, two of the most important, next-generation wide colour standards. Furthermore, HDR-PRO ensures the projector can deliver high dynamic range (HDR) pictures in all their glory, with integrated support for the very latest HDR10 and HLG video formats, as increasingly found on 4K discs and streaming content. Without the accurate colours of CinematicColor, you're simply not getting a true HDR image. The technology doesn't end there. BenQ’s Enhanced Colour Mapping function performs precision colour rendition to produce lifelike colours when viewing DCI-P3 4K Blu-ray movies. To achieve this, BenQ combines innovative technology in light sourcing, lenses, colour wheels, tone mapping and colour calibration to produce high-quality, highly accurate home theatre projectors. BenQ is the industry’s only home projector brand to adopt such high standards of colour calibration and ensure that colour is continually reproduced accurately – nothing added, nothing removed. Using special instruments and software, each CinematicColor projector is also tested and adjusted before leaving the factory. But while the technology inside the BenQ W2700 is complex, setting up the projector and experiencing the picture performance is a simple process. There's the versatile short throw, which allows for a variety of placement options, plus the 1.3X zoom and vertical lens shift. The projector is flexible enough to work in almost any room – and, thanks to durable Digital Light Processing, it will deliver long-lasting, razor-sharp clarity. And thanks to the ISF calibration, rigid testing procedures and the work of BenQ's user experience experts, you can depend on a high level of performance right out of the box. Want to take things to the next level? If you're prepared to stretch your budget and have a space that goes dark enough – or better still, a dedicated home cinema dark room – then the BenQ W5700 will do just that job. A step-up in performance, this model also features CinematicColor technology, has a true 4K resolution and is an HDR-PRO projector, optimised for HDR and HLG technology.